Category: Books. 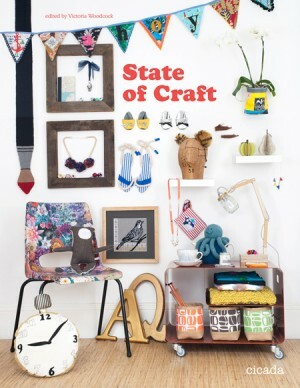 Tags: State of Craft, Victoria Woodcock, Ziggy Hanaor. Edited by Victoria Woodcock, Ziggy Hanaor. In the first decade of the twenty-first century, as the perils of globalized consumerism became an omnipresent reality and a topic of which all were aware, a small critical mass began to eschew mass-produced domestic design in favor of producing handmade and recycled objects themselves. The craft revolution of the early 2000s gained early visibility with the renewed popularity of knitting, which in turn revived the dying arts of crochet, embroidery, bricolage and macramé, seeping from the fringes of the culture into its mainstream. In 2005, Victoria Woodcock and Ziggy Hanaor edited Making Stuff, one of the first alternative craft books to hit the shelves and draw the spotlight to this burgeoning movement. With State of Craft, Woodcock and Hanaor shake things up once again, offering a fully illustrated how-to guide for making everything from mobiles to lampshades. State of Craft features interviews and contributions from all the hottest international craft megastars including Tatty Devine, Urban Cross Stitch and DIY Couture. Clearly explained, step-by-step craft ideas range from homemade underwear to pompom necklaces and angle poise lamps made with jars. Craft has inspired a whole generation of hipsters, and has come a long way in the past ten years. State of Craft brings it all up to date. Format: Pbk, 6.75 x 8.75 in. / 224 pgs / 380 color.